DUMBARTON came away from the imposing Falkirk Stadium with a well-earned point after a 1-1 draw. DUMBARTON came away from the imposing Falkirk Stadium with a well-earned point after a 1-1 draw with Peter Houston's side. 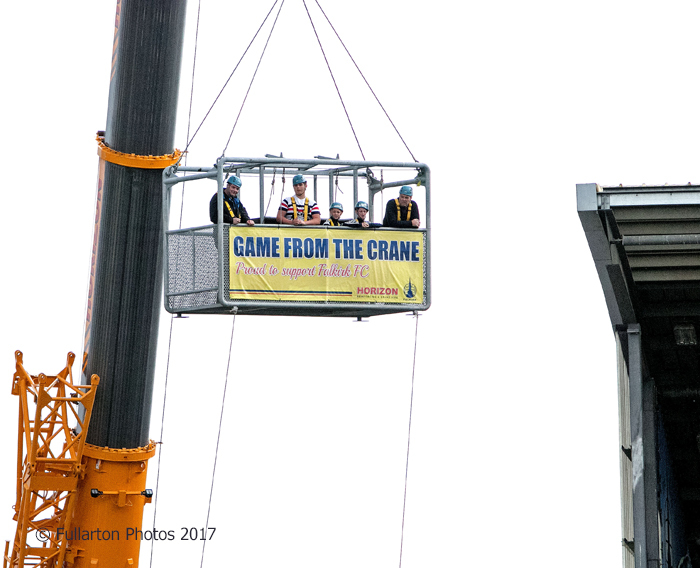 A crowd of over 3,800 — including some brave souls hoisted aloft by a crane — saw a fine defensive display by the visitors to make it two draws in two Ladbrokes Championship matches. On 14 minutes Sons went 1-0 up when David Wilson exploited a gap at the back to send Alistair Roy through for a solid finish to Bairns keeper Robbie Thomson's right. Falkirk were level eleven minutes later. Nathan Austin went down in the area under Mark Stewart's challenge before Myles Hippolyte sent Scott Gallacher the wrong way from the penalty spot for 1-1. Dumbarton nearly went ahead again from Tom Walsh moments later, but his shot was blocked. The visitors then hit the crossbar from the second of three corners in a sustained spell of pressure. The game was fairly even after the break, though the Bairns looked more dangerous on the attack and claimed much more of the ball, with relentless from the home side. On 86 minutes Mark Stewart forced the Falkirk keeper into a decent save with a powerful volley, and Scott Gallacher made some important late saves.